Well, most of you who know me already know how much I LOVE Really Reasonable Ribbon and all their AWESOME ribbons, laces, trims and more. For this particular card, I wanted to create a card for a special friend, and I knew that Really Reasonable Ribbon would make my card super special. I started with a piece of floral patterned paper that I touched the edges of with paint, and then machine stitched. 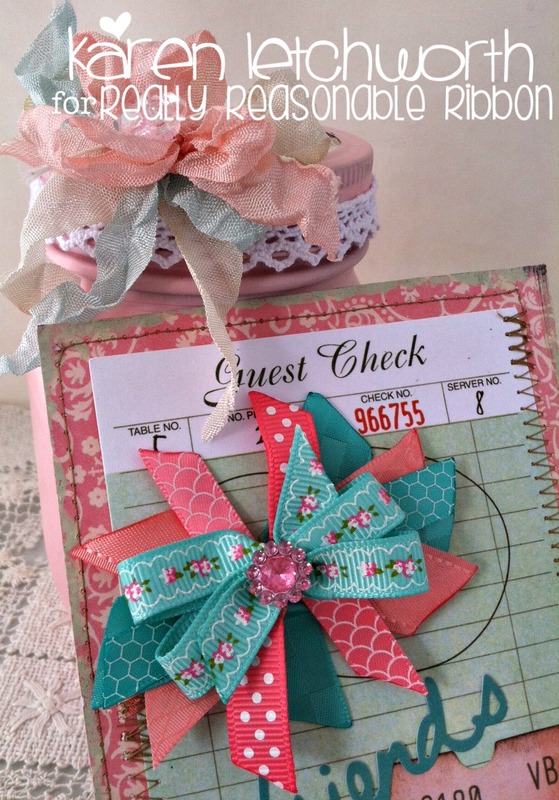 Next, I added a cute "Guest Check" card and ticket from Basic Grey, and topped that with a FABULOUS bow created with several lovely ribbons from.......you guessed it - Really Reasonable Ribbon! The pretty bow I added includes the super sweet Roses With Scalloped Edge Grosgrain in Aqua (the pretty floral print), 3/8" Shell Print on Coral Rose Satin Ribbon, Satin With Grosgrain Edge Light Coral, Diamond Satin Light Coral, Swiss Dot Grosgrain in Coral Rose (a Really Reasonable Ribbon exclusive), 3/8" Shell Print on Turquoise Satin Ribbon, and finally the beautiful Double-Faced Satin in Turquoise. It's just small pieces of each, and then they secured (or cinched) in the middle to create a bow. Then I placed a little pink gem in the center of the bow. This second photo gives you a closer look at the bow and all the ribbons used in it. They all have such great textures and lovely background prints, making them all unique, and yet they all work together SO well. That's one of the really great things about Really Reasonable Ribbon; they make it SO easy to combine ribbons together beautifully. You really can't go wrong. Finally, I want to mention the jar in my photos. I decorated it by taking a canning jar and spray painting it, and then I adorned the lid with more of Really Reasonable Ribbon's GREAT trims including their sweet Helen White Crochet Lace, Cream Seam Binding, Rose Petal Seam Binding and the luscious Bay Leaf Seam Binding (my personal favorite). 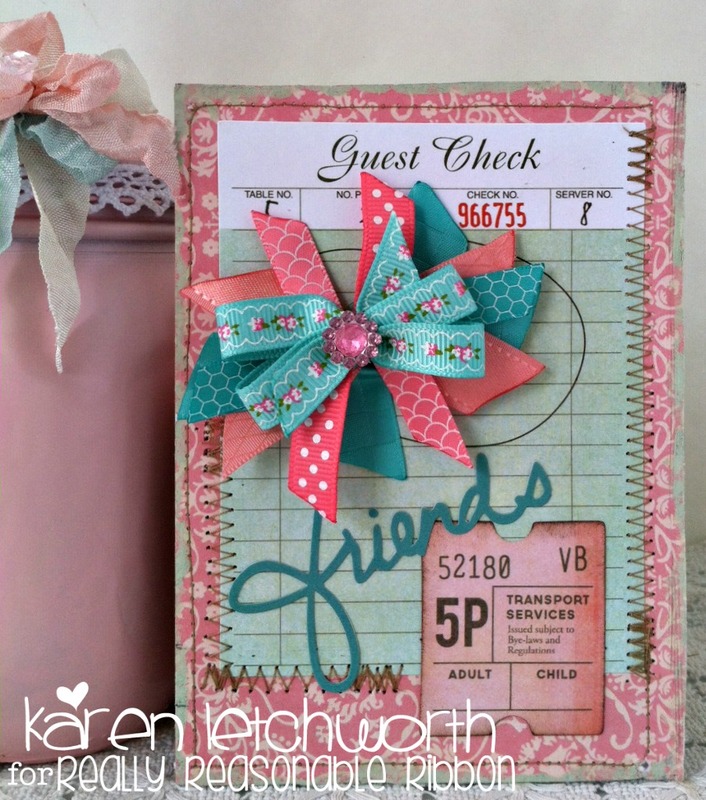 But again, they ALL work together SO beautifully, and make your projects look fabulous! Why not treat yourself to some today? You deserve it, and you will absolutely LOVE everything you purchase. Thanks so much for stopping by today. I always appreciate your sweet comments when you stop by to visit, and I want you to know how very grateful I am to have you here. I look forward to visiting your blog as well, and really hope that you will play along in Really Reasonable Ribbons FUN CHALLENGE going on now. 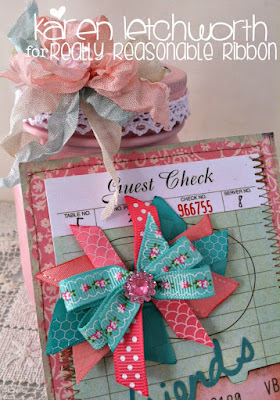 3 Girl Jam - August Challenge - Anything Goes - I love playing along at this fun challenge, and would be so delighted to win some of their GORGEOUS crinkle ribbon/seam binding. Karen, I love this! 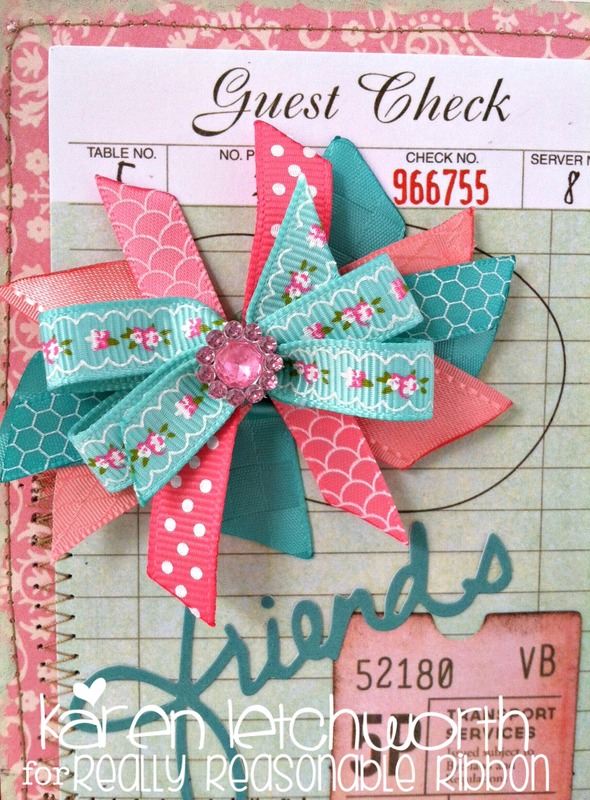 I love the guest check papers and the colors of this card and beautiful bow!! Hope your day is blessed! 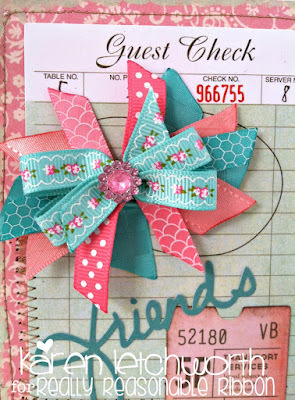 What a pretty card, and mason ja,r Karen - you really are talented when it come to working with ribbons. Love those ribbons. The stitching makes it so elegant. Love the fun bow! Awesome colors and card! Thanks for sharing and joining us at 3 Girl JAM! This is beautiful! I just love the ribbon flower! Thanks for entering at 3GJ!